With over 12 years of experience providing consultations to Fortune 500 companies, non-profits, and government agencies, Dr. Higgins is knowledgeable and comfortable with engaging corporations and organizations. 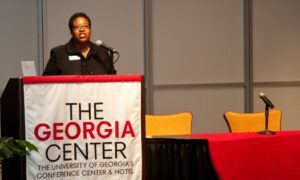 Through networking events and consultation meetings, she has engaged over 250 employers and developed a niche for speaking about diversity recruiting, developing inclusive work environments, and examining the impact of bias on your business. 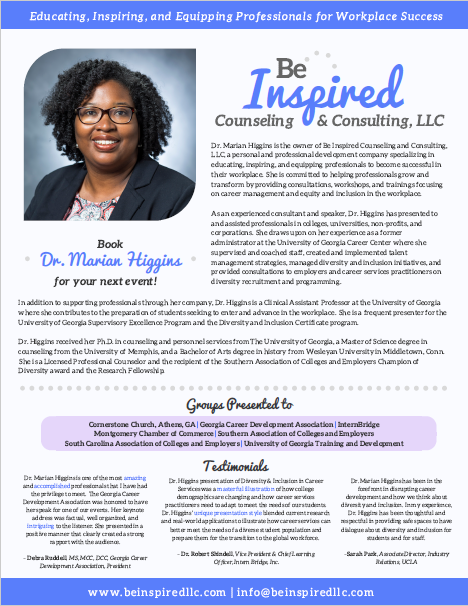 Invite Dr. Higgins to inspire you and your colleagues. She is available to speak at your next meeting, training, or virtual event. Today’s college campuses are filled with diverse talent but how can you effectively connect with this generation of students and market opportunities with your company? Dr. Higgins knows the most effective strategies for finding ideal talent on college campuses. She understands what students seek from companies and how companies can market their opportunities to attract the best talent. As organizations focus on increasing diversity among their employees, it is also important for organizations to provide welcoming environments for all employees. Inclusive workplaces are significant to recruiting and retaining employees. Employees want to work in environments where they can be themselves and where they are appreciated as such. Research has shown that employees are happier, more satisfied and engaged when they feel included at work. Everyone has biases. Yes, even you. But how often do we admit them and consider their impact on our employees and customers? Implicit bias is judgments and behaviors that we display unconsciously. These unconscious thoughts guide your day-to-day interactions and lead to behaviors that negatively affect employers and customers. Ultimately resulting in a negative impact on your bottom line.